COMFORT AND CONVENIENCE: The first thing you’ll feel is the comfortable seat and you’ll notice the roominess of the full-flat step through operator platform. Next, you’ll appreciate the increased horsepower, especially when taking on big jobs or mowing long grass. But most of all, you’ll be pleasantly surprised at just how easy it is to use. 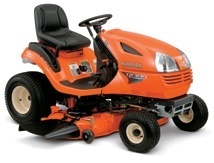 KUBOTA INFINITY DECK: Named for its distinctive counter-rotating figure-eight grass flow, the Infinity Deck’s most notable benefit is its ability to quickly and easily change cutting modes without having to change blades. Speedily change from one mode to the other: 1. Side-discharge mode. 2. Mulching mode. 3. Grass catching mode. STEP-THROUGH OPERATOR PLATFORM: The T Series features a full-flat operator's platform for ample floor space and legroom. It also makes getting on and off the tractor easy. CONVENIENT OPERATION: 1. Easy mower-lift lever to release the mower deck and raise or lower as needed. 2. One-step parking brake. 3. Adjust cutting height easily with the simple dial under your seat. 4. Larger rear tires for better traction and stability. LOW EFFORT DRIVING AND STEERING: The hydrostatic transmission (HST) makes operating the T Series easier and more precise than ever. A single pedal controls both speed and direction changes quickly, without shifting or clutching. This keeps your hands free at all times to help maneuver around tough obstacles and work better in confined spaces.